We provide webmaster services, digital marketing, SEO and ad campaigns designed to spread your message online, get more customers and automate your business. CMS (Content Management Systems) - Wordpress, Joomla, Drupal, etc. 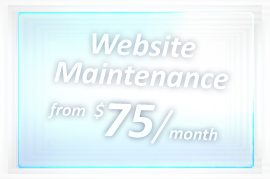 For over 16 years, we have been designing, maintaining and promoting successful websites and web applications. We're honest and won't sell you things that you don't need - and we are grateful that most of our business comes from the referrals of happy customers! generous consultation, including independent, unbiased evaluation of popular web services like web hosting companies, ecommerce platforms, etc. Call for a free consultation or to see samples of our work (we'll send you a link to our private portfolio). Or just call to pick our brains – including free advice on choosing the best website name (domain name) for SEO purposes and the best web hosting companies for your unique situation. Which hosting company do you recommend for Wordpress Hosting? Is Godaddy hosting right for my needs? Which Wordpress plugins are essential? What is SEO? How to do SEO? Should I invest in SEO services? Why is my website so slow? Want to discuss your digital marketing goals over coffee? We are conveniently located within easy driving distance of Scottsdale, Chandler, Mesa, Ahwatukee, Gilbert, Queen Creek and Phoenix Arizona.